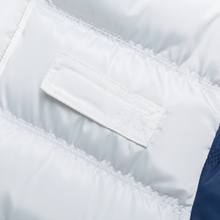 Warm: Quilted puffer coat features a thicken poly fill for added warmth. Three-piece detachable hood with faux-fur trim could keep your head cozy and insulated in the chill winter climates. Windproof: Full-zip front closure with snap-placket covered for warmth and protection against wind. Stand collar outwear coat with snap-buton hood can protect your ears from wind and frostbite. Comfortable: Long sleeves featuring ribbed cuff and straight hem offer comfort for you. Hip length free to move and regular fit cozy for everyday wear. Best use: Hiking, traveling, clmibing, camping, casual, everyday wear and other outdoor activities. Matched free with sweatshirt, sweater, suits, shirts, customizing your style. 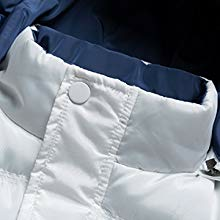 Detail: This ski jacket with spilce element looks stylish. 2 handwarm pockets and interior chest pockets for outdoor essentials as you like. Machine washable ( Hand wash recommend ). 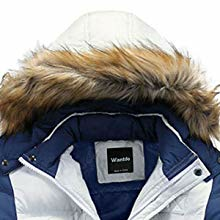 Wantdo puffer coats, stylish and insulated, maintain a moderate warmth-to-weight ratio, and ensure that you stay warm, even when the temperature is going to dip well below freezing. Puffer insulated jacket layers well with a shell on colder days, offering excellent cold-weather wear for city or mountain use. 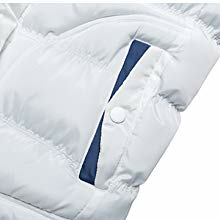 The adjustable hood with additional button closure helps seal coldness out for your cold-weather outdoor fun.Thanks to the polyester shell and cotton lining, you can reach your destination warm and comfortable. This insulated jacket keeps you toasty warm and moving all season long. Three-piece removable hood with faux-fur provides comfort and warmth for your head. Full-zip front closure with snap-placket covered could seal out wind and seal in warmth. 2 hand pockets and 2 inner pockets are safe for outdoor. Inner pockets are safe for keys, phones, wallet. The special design can hang pens, sunglasses, earphones and other small items for easy outdoors.